Above is a simple comic sequence I created to illustrate some fundamental aspects of film language. It was created with the Comic! App and a couple of action figures. My son Jonas and I like to put these guys into conversations and these two batmen seemed to want to bicker with one another. The graphic sequence uses some basic cinematic language to give the audience a sense of subjectivity. Whose scene is it? From whose perspective are we appreciating the conflict in the scene? What is the emotional narrative of the scene for the black Batman? Is it clear? Let’s examine how the sequence makes the answers to these questions clear. First, we want the audience to appreciate the scene from the black Batman’s perspective. Emotionally, we can most appreciate the conflict in the scene from his perspective. Specifically, we want the audience to “read” the moment where Blackman decides to lash out. Narratively, we recognize his objective: to establish himself as “the” one and only Batman. White batman stands in opposition to ceding that recognition. The opening frame is a two-shot with a formal profile composition. This feels objective and doesn’t favor one character over another. The next frame (or cut) is an over-the-shoulder medium close-up on Blackman. This cues the audience to pay immediate attention to him. The change in angle to a framing tighter to his eye-line reads as more subjective, indicating his escalating emotion. We also read the visual separation of the characters a clear opposition. The next frame mirrors the previous, a reversal that doesn’t escalate the subjective, but clearly establishes the sense of opposition from Blackman’s point of view. Now we arrive at the moment when we want the audience to read the moment where Blackman struggles with his next move. A close-up on an even tighter eye-line, the most subjective of the sequence. The frame reads as frustration. This leads to the final frame and his action: to attack. The sequence works from the outside in: start from a wide establishing shot and move in, objective to subjective. The sequence also moves progressively closer to Blackman’s eye-line to help assign the escalation of emotion to him. Critical to the methodology of how an audience reads the sequence is their recognition of change. Change cues the audience to read meaning into what changes. Each frame progressively focus the audience’s attention on the essential moments in the sequence. As to why profile shots feel less subjective than shots tighter to the eye-line has to do with how we read the emotion in people’s faces. We interpret expressions better from straight-on, as when we are on the receiving end of the emotion. That established, even when there is no change in the expression on the subjects face, the change in angle suggests something has changed internally for the subject. Quite an academic analysis of cinematic dialectics for such a simple narrative sequence. What better way to demonstrate how to visually articulate a set of narrative goals. 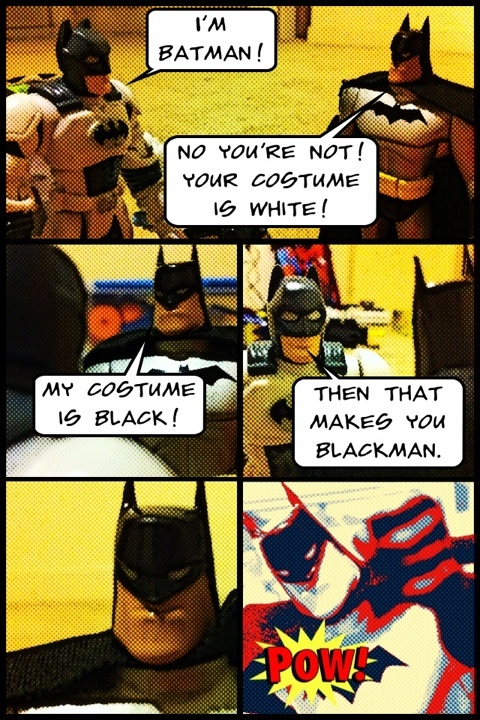 Please note that Blackman’s animosity has nothing to do with race and is simply his desire for recognition as the real Batman.